I'd been looking at foldable electric bikes since 2012 and this past July I bought one. My thinking was that I could load it in my plane and use it, instead of renting a car, at my destination. This idea would be a one-bike endeavor, though. 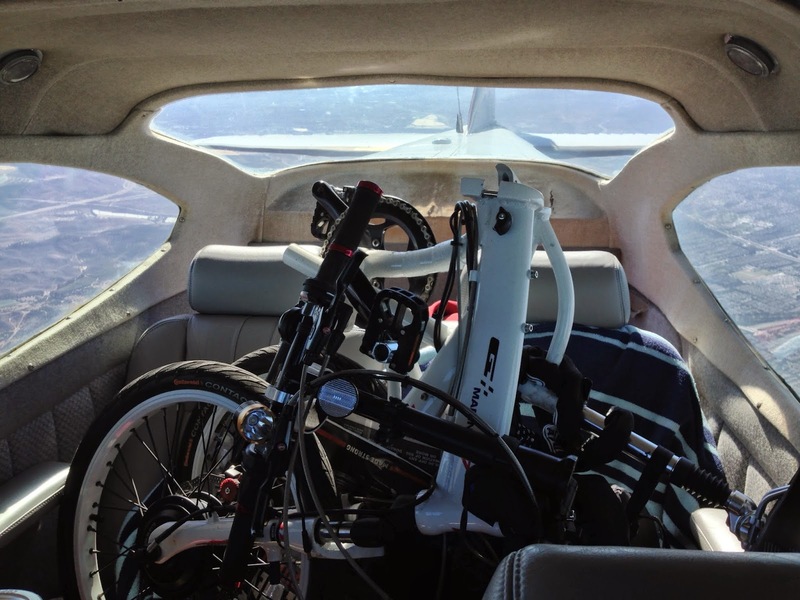 Even though my plane can seat four people, it would be difficult to squeeze in more than one bike. Yesterday, I finally got a chance to try out my transportation mix when I flew up to La Verne to have lunch with my life-long friend, Andy. I told him not to worry about picking me up at the airport. Using my electric bike to cover the four miles from the airport to his house would be a cinch. It's always a learning experience the first time I try something new. I remembered to pack my helmet and even though the bike has a 25-35 mile range, I packed the battery charger, too, just in case. I even remembered to bring flowers for Andy's wife since they're newlyweds. I had to laugh at myself when I landed at the airport, took out the bike and hinged it together. I forgot to bring the key. No ignition key for the bike meant no electric power. Of course, I was too proud to call Andy for a lift so I had to use old fashioned human pedal power. I don't mind making mistakes and learning from them. But I despise making repeat mistakes. So, to avoid this problem in the future I've placed one of the three keys for the bike in my flight bag. I will certainly never fly without it, again.